The Council on Asian Pacific Americans recently announced that they will be accepting applications for the Orange Crane Asian Pacific American Artist Retreat 2011, which will help support beginning-level emerging Minnesota Artists who wish to develop professional-level skills and perspectives. While my natural talent for artistic endeavors is much more limited than my appreciation for great art, I'm certainly a fan of supporting its role in helping to shape a healthy and rich society. Are you a lover or creator of art? Even as beginners in the latter, we can still become pros at promoting art and its myriad contributions to our local communities! 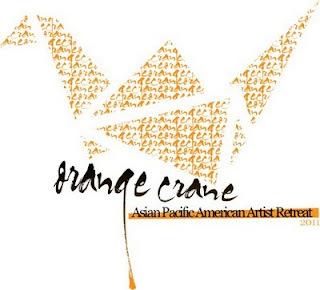 The significance of "orange crane." In many Asian cultures, the color orange symbolizes happiness and positive energy. The crane is often a symbol of peace, equality, wisdom and longevity. Art, in whichever form, wherever you are, is universal for being an outlet for anything and everything, as long as it allows the artist to find happiness. Our hopes for this retreat is to help aspiring artists to realize the things that they make them happy and to find a balance between an artist's intent and an appreciator's intepretation. About the APA Artist Retreat. The APA Artist Retreat is open to beginning-level emerging Minnesota artists who seek to cultivate new skills and ideas to enhance and transform their skills and creativity. The retreat will offer interactive workshops and presentations by established and award-winning artists for beginning artists who want to develop professional-level skills and perspectives to their art. Please click here to fill out the application. The deadline for applications is April 30, 2011 at 5:00pm. Applications will be reviewed and retreat participants will be announced May 6, 2011 via e-mail. You're Invited: Celebration of Women in the Arts! You're Invited: STLF Glory Days Tour!